Runners, remember when you had to get in the car and drive a route to see how many miles it was before you ran it? Then the GPS watch came onto the scene and everything changed. Since then, wearable running technology has evolved at break-neck pace with no slow-down in sight. If you're currently running with a device that's even just a few years old, you're probably missing out on a lot of impressive new features. Here's what the latest wearable tech has to offer runners. Beyond simply tracking pace, distance, cadence and heart rate, the newest wearables are using latest-generation optical heart rate technology and a new class of accelerometers to help runners track a host of physiological parameters and running dynamics. While the exact list of metrics varies a bit between manufacturers, nearly all latest-generation devices can track physiological markers like heart rate, estimated maximum heart rate, heart rate zones and VO2 max. The big running brands, like Garmin and Polar , go far beyond that though. 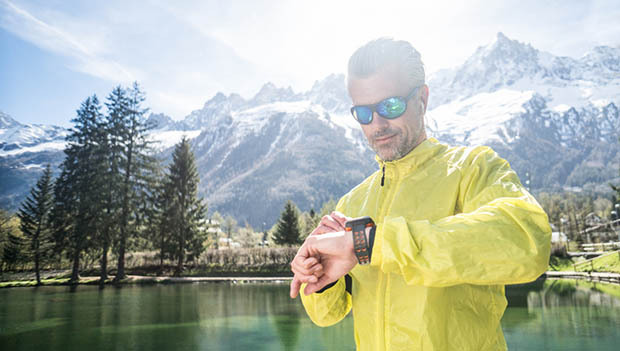 On its website, Garmin lists 14 physiological measurements and seven running dynamics metrics tracked by its newest running and multisport watches. Some of these metrics, like performance condition and running power, are probably only of interest to the biggest data nerds. But others, like training load, ground contact time, stride length and vertical oscillation can help runners tune up form errors and potentially avoid running-related injuries. For some devices, there is even a whole category of data that can help you monitor whether you're over-training and help you map out the most effective recovery schedule. Not all brands and devices offer all of these metrics, but even fitness trackers and smart watches can now deliver data on the most important running metrics. What's more, these days you don't even need to carry your phone or wear anything on your wrist to get feedback on your cadence and stride length, thanks to Under Armour's Bluetooth-enabled HOVR line of shoes. Simply start running and the shoes will wake up, track the data and store it for later extraction into the Under Armour MapMyRun app on your smartphone. The list of newly trackable metrics is certainly long and impressive, but how accurate is all this data? To find out, Active first spoke with Garmin product manager, Joe Heikes, and then scoured research for third-party opinions. We were happy to find two third-party studies that evaluated some key metrics of GPS sport watches. In a 2016 study published in the Journal of Orthopaedic & Sports Physical Therapy, Federico Pozzi, PhD, and colleagues tested a Garmin Fenix 2 paired with a Garmin HRM-Run chest strap against a gold standard motion-capture system for the metrics of cadence, ground contact time and vertical oscillation. The researchers found that the watch's data was both valid and reliable on those three metrics, and Dr. Pozzi confirmed via email that neither he nor the other study authors had any affiliation with Garmin at the time of the study. A couple of graduate students at Aalborg University in Denmark found very similar results the following year when they conducted their own test of the same three metrics, plus stride length, using slightly different Garmin gear. While not as accurate as the data you'll get from a running gait analysis in a lab, the latest wearable tech does appear well-suited to the general running enthusiast. As Heikes noted, "On the running dynamics measurements, the goal was to bring these measurements to the masses, to everyone who wants to have access to these sort of measurements at an affordable price. Most people can't afford to go have a high-speed camera gait analysis done. Our watches are basically for anyone who would say that 'running is their thing,' not necessarily if they're fast or slow." For all the bells and whistles the latest devices have to offer, we had a hard time finding many runners who are using the new features. "Most of this stuff falls into the, 'Hmm, kind of interesting, but I won't actually use it' category," Dustin Brown, an ultrarunner from Maple Lake, Minnesota, said. He did note, though, that seeing how the metrics change during different workouts is really interesting. He also added, "I am intrigued by the performance condition metric, though I'm not totally sure what it means." To be sure, we all have some catching up to do if we're to make the best use of the trove of data available with these new devices. Some runners, though, will probably just keep kickin' it old-school, like Bob Smith of Hudson, Wisconsin: "I had a pair of shoes that had a Bluetooth thing in the insole that was supposed to tell you about your gait and pace and all of that. It basically said that I was running too slow and wrong. So I stopped using them. That was about 500 miles ago." If you, like Smith, just want to get out and run, you don't need the latest gadget to do it. But for data geeks, competitive weekend warriors and serious runners, the latest wearable running tech has more to offer than ever before.